Did you make those block or was it a swap? They look great together. They were a swap. They were supposed to be Christmas colors, but with "pink or cranberry" instead of red. 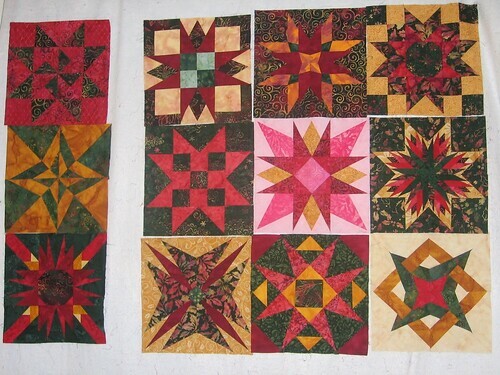 The pink block in the center is the one I made - clearly I picked up on a different part of the instructions than everybody else did! But I think with cranberry sashing they will look good. I guess so! The pink instead of red for Christmas colors was an interesting idea too. Your is very pretty. Is the 1 pink block the reason that you are having trouble deciding placement? I think these blocks mostly dictated their own placement. The pink block clearly had to go in the middle, which is why three of the blocks are fated to become a table runner. The rest of them divided up into 5 green background, 4 gold background, one red, and one that was about evenly divided between green and gold. One of the greens was much darker than the rest, so I put it with the other two "odd men out" (which are also pretty dark, overall) and I think they will make a good table runner. So that left 4 green and 4 gold, which clearly needed to alternate... See, they practically arranged themselves! I love those blocks! And they will look so elegant and rich with the cranberry settings. I love your quilt block -- put it in the center and be proud! It is the bright star!